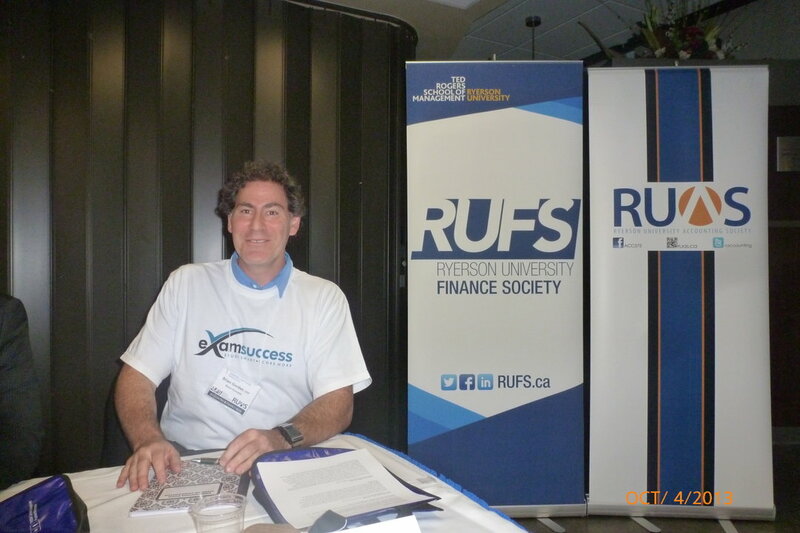 Prof. Gordon was invited to be a panel guest at the Finance and Accounting Societies'’ career event. The event was held at the Ted Rogers School of Management at Ryerson University in Toronto, Canada. Prof. Gordon handled questions regarding many of the designations, however he was invited to speak specifically about the CFP designation and to give career advice to students looking to work as Financial Planners. After the formal question period, students were encouraged to network with the panel guests. The entire event was a great opportunity for students to gain knowledge not found in any textbook about the various industry designations and the potential careers they may lead to! Which designation should I get? In my role as a Finance Professor and industry exam preparation expert, I am often asked what courses, certificates or degrees a candidate should get to further their career. A common mistake I see is candidates taking courses that “everyone else has”. Blindly following the crowd is like going on a road trip without a map – you will do a lot of travelling, but you won’t get anywhere. So I say “start at the end”. By this I mean, look up companies where you think you might want to work. Then look at the profiles of people who are currently doing the job you want. See the qualifications they have and this will be a pretty good indication of the courses, certificates or degrees you will need to get into that role. Pretty simple advice....I know, but sometimes its the obvious answer stairing us straight in the face and we miss it! Well another CFA exam is behind us and we now have a chance to catch our breath! The theme is the same…expect the unexpected! There is no doubt about it, using the CFA curriculum texts to prepare for the CFA exam is the best way to go. Maybe it is just my bias, as a Finance Professor and having taught CFA prep classes for the better part of the last 15 years, but I see this time and time again and the solution is staring us right in the face. The examples in the CFA Curriculum texts are the best tools to use to prepare for the exam. For Level 1 they provide an excellent example of what to expect in terms of exam level questions. For Level 2 they seem to flow like a true exam Item Set and for Level 3 they provide the key words required to answer the essay questions the “CFA way”. I know it is the last thing on your mind at this point, having just written the exam, however, if you are serious about earning the CFA Charter and want to talk about what you should be doing now feel free to drop me a line….or if you prefer, send me an email when you get your results! Best of luck to all CFA Candidates! MAR 2013 - Over the years I have found myself telling CFA exam candidates the same message – do as many practice questions and mock exams as you can! Now, when I say mock exam, I do not necessarily mean sit down and do a 6 hour full CFA mock exam. While that experience will certainly give you an idea of the stamina you need for exam day, I think it gives little else. I think CFA exam candidates should look to shorter mock exams and quizzes when practicing questions. My “30 in 45 Minutes” rule is exactly that…do 30 questions in 45 minutes and then go back and see how you did. By working through questions in just 45 minutes, you will still have the mental energy to review material after doing all the practice questions. I suggest that you look up the answers to the questions you got wrong and try to teach yourself the concept. Make brief notes or bullet points (in the question space) as you work through the questions so you will have a record of your thinking process, to which you can later refer to when you are marking your practice exam quiz. This record will provide you with the ability to identify what you know and what you don’t know and to pinpoint exactly where you went wrong and what work you must do to help yourself overcome the obstacle. Be honest with yourself, if you do not write down brief notes or you look at the answer after each question, “...just to see how you are doing…”, you can fall into the “that’s what I meant” trap – fooling yourself into thinking you know the concept, when in fact you do not. Year after year I see candidates use mock exams or practice questions in the wrong way, which leads to disappointment when the exam results are released. In summary, mock exams and practice questions are a powerful tool which you can use to layer in extra marks to get yourself over the passing score, but like any tool, you must know how to use it correctly. Should I still do the CFA? The growth in the popularity of earning the CFA Charter has been tremendous over just the last decade or so. The Chartered Financial Analyst designation is one of the most sought after credentials in the industry and it will certainly help get your foot in the door, BUT it is no guarantee to the corner office! In my opinion, the purpose of any non regulatory required credential is simply....for marketing purposes. Marketing yourself to get a job or get a promotion or marketing to get clients. The CFA Charters brings with it a certain amount of instant cred.....employers and prospective clients will feel more at ease thinking you know what you are talking about. The CFA exam process has changed over the years and has now become, in my opinion, just a standardized industry examination that is more of an entry requirement, than an advanced completion designation for seasoned industry pros. So should you go ahead and subject yourself to the 3 or 4 or more years it will take to finally earn the charter? The answer is a resounding...YES....the benefits that come with this prestigious designation far out weigh the costs in terms of money, time and energy you will expend earning it. So get in the program, dedicate yourself to the experience of earning the charter and you will be handsomely rewarded! The CFA level 1 exam consists of 240 multiple choice questions. The exam is given in two sessions the AM and PM, each exam has 120 questions and each topic is tested in both sessions. 4) Be honest with yourself, if you don’t know it….look it up and earn it, do not simply assume that if you can guess it correctly on a practice exam, then you can guess it correctly on the actual CFA exam…learn it! 5) Layer in these extra marks to get yourself over the passing score and you will be on your way to Level 2! Nothing says that you are a dedicated professional like a commitment to continuing self improvement through education. So, which designation is right for you? I am often asked by Advisors which designation they should pursue and I always answer the same way - get a game plan. Don't think about just taking a course here or there, think about what would make the most sense for you and your clientele and set out a 2 or 3 year plan. If you are at an IIROC Member firm, I would recommend that you map out a route to work towards achieving the FCSI designation. CSI Global (formerly the Canadian Securities Institute) is the go to place for many industry designations. It is well respected and its designations are recognized by both industry and investors, so earning a designation from this place, will help you get a job and get clients. If you have already completed courses and designations from CSI Global, then I'd recommend you map out a route towards earning the CFP designation offered by the Financial Planners Standards Council. The CFP certification process has undergone a complete transformation this past year, (I have a 1 page summary, please email me if you would like to receive it), making it a bit more difficult to achieve CFP certification. The designations mentioned so far are the ones that are most directly pointed towards retail Investment Advisors. Of course there is always the Chartered Financial Analyst designation or CFA Charter as it is commonly known. In my opinion, the CFA program is more suited towards would be Investment Analysts and aspiring Portfolio Managers. However, many retail Investment Advisors earn the CFA Charter because it does bring instant credibility and is recognized as a premier financial industry credential. OK, so what do you do if you do not have an MBA, CFA or other industry credential? To propel yourself right to the head of the pack and really differentiate yourself, I'd recommend looking into earning a CMA or CGA Professional Accounting designation. Both are well respected and bring credibility on the same level or even higher than MBA, CFA or CFP. So just like any other aspect of building your business, building your credentials requires a well thought out plan. I just wrote the Level 1 CFA exam, now what should I do? Ok, so you just sat through the wonderful experience known as the CFA examination - welcome! It may feel weird not to have to pick up your books and head off to study, an all consuming routine you no doubt have followed for the last several weeks. Take some time to relax, what’s done is done you can’t change anything. I am pretty sure your mind is still racing thinking about specific questions on the exam and what you should have done, you may even still be having your “CFA Curriculum” dreams - anybody look over their notes today? Go ahead, admit it, I know I did! The CFA Institute releases the December exam results during the third week of January, so what should you do between now and that date? You want to get started on Level 2, but what if you fail Level 1? I suggest that you go to the CFA Institute website and download the Level 2 Learning Outcome Statements (LOS), look them over to get a feel for the topic material in each Study Session. The Study Sessions may have the same subject titles as you saw in Level 1, however you should be aware that the Level 2 Curriculum is much more focused in terms of depth and level of understanding of specific topics that you are required to master within each subject area, than the Level 1 Curriculum. You should also be aware that the specific topics in Accounting and Equity make up 40% of the Level 2 exam, so these subjects should be your prime focus. Having taught in the finance area for the past decade, I have come across a lot of great texts and lecture PDFs that parallel the CFA material and I can point you in the right direction so you can gain a better sense of the material without getting too deep into it. If you would like some suggestions, please feel free to email me. Stay positive, and make the time between now and when your new CFA Curriculum materials arrive a productive period! I want to wish everyone good luck on the Level 1 exam Saturday. Here are a few last minute exam tips that I think will help you perform well on the exam. Relax, you do not need to get 80% or 90% to pass this exam. As a matter of fact, I really doubt that you need over 70% to pass. Do not be afraid to skip questions. Time pressure is a major factor in this exam and running out of time before you answer all the questions is a sure fire way to fail this exam. Get the “easy” marks first and then go back to tackle the difficult questions. You have 1.5 minutes to complete each question, some will take you 10 seconds to answer and other will require more than 1.5 minutes. I suggest you read the question as quickly as you can and ask yourself; “can I answer this question?” if yes, do it, if no, ask yourself; “can I eliminate any of the choices?” if yes do it, and if that is it, MOVE on! If no, you should have already moved on! When answering the questions, make sure you are framing your thoughts within the CFA curriculum. Ask yourself; “where does this fit in to the CFA curriculum and what is the broad principle?” The answers are usually more straight forward than you think. Do not over think the question or change it into something “you want it to ask”. Answer the question ask and do not assume anything else applies, unless you are given specific information in the question. Lastly, study at the lunch break! Yes, do it! The exam is symmetrical, so if you don’t see questions on a specific topic in the morning, you can expect to see some in the afternoon. I recommend taking the CFA Curriculum bullet summaries and EOC questions to review. Just rip them out and make them into your own cram notes! Believe me when I say you will never use the texts as reference, so don’t save them. Next year, well actually in about one month, you will get a brand new set! So, relax, you’ve study for this, you know more than you think you know. Go for the easy marks, eliminate choices when you can, skip the difficult questions (of course go back and guess if you must) and you will be on to Level 2. Please look for my exam tips and strategies coming out in January. Co-Director, Financial Analyst Certificate Program, Queen’s University. Exam results are reported to candidates as "pass" or "fail" within 90 days (60 days for Level I and Level II) of the exam date. You must attend both sessions or your exam will not be graded and you will not receive results. If you do not sit for the morning session, you will not be permitted to sit for the afternoon session. Individual candidate results are only released to the candidate and are never released to a third party; however, lists of passing candidates are provided to societies for membership purposes. Print a copy of your results as a permanent record. Results will be available for approximately one year after the exam date. Subsequently, an official letter can be provided indicating only a pass or fail result; the analysis grid will not be available. The minimum passing score (MPS) for each level of the exam is determined by the CFA Institute Board of Governors each year after the administration of the exams. Neither the MPS nor individual candidate scores have ever been released. To set the MPS before the administration of the exams would require that an absolute standard be applied without regard to the difficulty of the exams; this could potentially be very unfair to candidates, especially across time. The score matrix provided on the exam results is an indicator of overall performance and cannot be used to determine approximate scores or pass/fail status. The “≤50%” range is considered poor; “51%–70%” is considered poor to average; “>70%” is considered average to above average. If you are not satisfied with your exam results, you may request that your exam score be manually retabulated. Should you choose to request a retabulation, your request form and payment must be received within 30 days after results are released. The cost is US$100. Learn more and download the form (form is only available for 30 days after results are released; candidate login required). All exam materials, including answers, are the property of CFA Institute and will not be returned to you in either original or copied form. Toronto, January 24, 2011 — On November 6, 2010, 455 individuals wrote Financial Planning Standards Council's (FPSC) first-ever sitting of Financial Planning Examination Level 1 (FPE1TM), and 76 per cent (346) passed. These successful candidates are now eligible to become FPSC Registered Candidates, a key milestone on the path to Certified Financial Planner® certification. Changes to the CFP certification program officially came into effect on July 1, 2010. The program now includes an additional Capstone Course requirement and a two-staged examination process (Financial Planning Examination Level 1 and Level 2), which replaces the single six-hour CFP Examination. Once candidates have successfully passed FPE1, in order to remain eligible for CFP certification they must become Registered Candidates with FPSC and maintain continuous registration until they attain CFP certification. This annual registration process includes agreeing to adhere to the CFP Code of Ethics and CFP Financial Planning Practice Standards established by FPSC. "Congratulations to the successful candidates of FPSC's first-ever sitting of FPE1. Passing FPE1 is a demonstration of mastery in financial planning fundamentals, essential for a career in financial planning," says John Wickett, Senior Vice President, Standards & Certification, FPSC. "Equally important, candidates who annually maintain their Registered Candidate status send the message to clients and employers that they are already committed to the highest standards of ethics and practice as they advance towards CFP certification." Registered Candidates Receive Official Recognition from FPSC: All FPSC Registered Candidates will have their name published on the FPSC website, indicating this milestone on the path to CFP certification and that they have agreed to abide by the CFP Code of Ethics and CFP Financial Planning Practice Standards. As well, FPSC provides each Registered Candidate with a personalized online dashboard, progress-tracking tools, and diagnostics regarding their performance on FPE1 to guide and support them on their path to certification. To learn more about CFP certification and view the complete Certification Guidelines, click here. To learn more about the FPSC Registered Candidate program, click here. Financial Planning Standards Council (FPSC) is a not–for–profit organization dedicated to ensuring the financial planning needs of Canadians are well served. We develop, promote and enforce professional standards in financial planning through CFP® certification, and raise awareness of the importance of financial planning to Canadians. FPSC has received ISO 17024 accreditation from the Standards Council of Canada (SCC) for its role as the certifying body for the CFP® certification program in Canada. FPSC licenses the CERTIFIED FINANCIAL PLANNER® marks in Canada. There are currently more than 17,500 CFP professionals in Canada and more than 126,000 individuals who have earned CFP certification in 23 countries around the world. These individuals are licensed to use the registered marks: CFP®, CERTIFIED FINANCIAL PLANNER® and CFP (with flame logo)®. See www.fpsc.ca for more information. Toronto – August 3, 2005 – Schweser Study Program, a division of Kaplan Financial and a world leader in CFA® review, and Canadian Academics, a provider of financial industry exam preparation, have partnered to offer a 14-week classroom review for the December level 1 CFA exam held at the University of Toronto beginning August 24, 2005. In conjunction with instruction by Canadian Academics, registrants can receive Schweser’s Essential Solution including study notes, online tools, flashcards or practice exams and audio CDs or testing software offered at a discount price. “We are excited to bring a weekly review product to the Toronto market. Joining forces with Canadian Academics represents the ideal balance of excellence in materials and instruction,” said Dr. Andrew C. Temte, CFA, President of Schweser Study Program. Weekly review classes for the December Level 1 CFA exam are scheduled from August 24 through November 23, 2005 and will be held Wednesday evenings from 6:30pm to 9:30pm in the Bahen Centre at the University of Toronto. Additional information, course costs, updates and registration details for the weekly program presented by Canadian Academics and Schweser Study Program are located at www.canadianacademics.com or www.schweser.com. Beginning in the spring of 2006, Canadian Academics and Schweser Study Program will offer weekly review programs for all three levels of the June 2006 CFA exam. Canadian Academics provides in-house training, private coaching and specialty workshops for advisory professionals and corporations in service industries, including: banks, investment brokerages, insurance companies, mutual fund companies, law firms and IT firms. Schweser Study Program is a leading provider of preparation tools, live seminars and weekly programs for the Chartered Financial Analyst (CFA) and Financial Risk Manager (FRM) Exams. Schweser Study Program is a division of Kaplan Financial – a leader in financial services education. (January 2005) Are you in the midst of preparing for a financial industry exam such as the Canadian Securities Course, the Certified Financial Planners Professional Proficiency Exam or the Chartered Financial Analyst Exams? Here are some tips to consider to optimize your efforts — and your results! The environment in which you study is an important factor in determining your study effectiveness. Remove all distractions, go to a quiet place in your home, or better yet, go to a library — this will help your focus. The sight of other students studying will also motivate you. If you find your mind is wandering, get up and take a break. Don’t read just for the sake of reading – you’ll end up wasting your time and might have to repeat the material. Our short-term memory works by association, so the use of mnemonics, a technique of improving the memory by using acronyms or word associations, can be very effective in helping you remember lists, facts and formulas. An example of this would be: (A [assets] — B [bills] = C [cash needs]). Read the material, highlight significant passages and, very important, write your own study notes as you go. Are the classes large or small? Will you be able to access the teacher after the course has concluded? Is the length of the course appropriate for the amount of material to cover? Review programs come in all shapes and sizes and are not created equal. Weekend reviews are great if you’ve studied the material and are just looking for a forum to tie it all together. But they are not a last-chance cram session to rely on to get you through the exam successfully. Weekly lectures are a great way to integrate a systematic study schedule with a professional course. Above all, make sure you receive guidance from a qualified instructor who can address your needs. Tools of the trade are important, so get a financial calculator that you know how to use. It may sound basic, but many times students have had to ask me to help them set functions, input data or clear the memory in their calculators. The exam is no place to experiment or learn how your new HP functions! When you’re writing an exam, make sure you don’t give up the easy marks. The first chapter of the CSC is often overlooked by students, yet it tends to show up time and time again on the exam. Other exams contain qualitative-type questions dealing with the history of the financial services industry and the capital markets in general. These count just as much as the harder derivative and bond calculation questions, so go and get the easy ones first. If your exam is essay style, such as levels 2 and 3 of the CFA program, practicing sample exam questions and reviewing answers is critical to your success. Essay questions are graded by a group of industry professionals, who are often working from a sample answer. As a professor of accounting and finance and an exam grader, I look for key words in students’ answers that demonstrate an understanding of the material. Your job as the exam writer is to show the grader that you know what you are talking about. Utilizing key words and key phrases accomplishes this task. Your commitment to continuing education and professional development will help you forge a successful and rewarding career in the financial services industry. Best of luck with your studies! Brian Y. Gordon, CFA, MBA, FCSI is a professor of accounting and finance in the Faculty of Business at Centennial College. Exam questions and comments are welcome. (December 2004) Planning to attend an upcoming seminar or conference? Follow these common-sense guidelines to help maximize the benefits you derive from the next seminar or conference you attend. Prepare, Participate, Personal Challenge and Post-evaluation. When I deliver one of my educational or investment seminars, I try to gauge my audience and tailor my delivery specifically to meet their needs. In other words, I make sure I "know my clients." I then identify the key learning objectives that I want to articulate. As a seminar attendee, you need to actively prepare for your session in a similar way — before you step in the room. Why am I going to this seminar? What is the link to my business? What business-building opportunities do I foresee by attending this seminar? Take a look at the key learning objectives and the "what you will learn by attending this seminar" material that is promoted by the host. Set goals that are measurable. For example, networking goals could include the number of new business cards exchanged, while product knowledge or professional development goals could include the number of new ideas identified. Once you have your game plan in place, it’s time to act on it. Don’t sit at the back of your seminar. Join the crowd, mingle, network, introduce yourself when you sit down at a table, distribute and collect business cards. Listen to the presentation and take notes. Remember, you are there because you want to build your business and expand your personal skill set. A simple technique that will give everyone in the room an opportunity to see you, know who you are, and quickly form an impression of your capabilities, is to ask questions. By participating — networking, taking notes, asking questions, etc. — you will find that the seminar experience presents a much greater number of business development opportunities. After the seminar, challenge yourself to commit to following through on two or three ideas presented at the seminar. For example, you could follow through on product knowledge, or practice management, or you could initiate correspondence with your new contacts. Write these goals down, so that they become priorities in your business development. After a reasonable period of time, say three to six months, revisit your written notes and see how many of these challenges you actually followed through on. Now that you have actively prepared for your seminar, forced yourself to participate and challenged yourself to follow through on a few activities, you need to evaluate whether or not your actions made you money by building your business. Once you have identified an action as a profitable business-building activity, add it to your list of "things to do at a seminar or conference" list. After attending several seminars or conferences, you should have discovered a number of these profitable business-building activities that you can reap the rewards from again and again. (October 2004) I am often asked by my students to describe the “best” way to prepare for a financial industry exam, such as the Canadian Securities Course, the Certified Financial Planners Professional Proficiency Exam or the Chartered Financial Analyst Exams. My reply is simple: Study actively not passively! The backbone of an active study plan involves creating a systematic study schedule that breaks down the required body of knowledge into more manageable segments. This can be done by chapter or specific topic. Give yourself a “pre-test” to find out where your knowledge lies. This will help you identify your strengths and weaknesses. Now you are ready to focus your study efforts on the topics you don’t fully understand. I recommend students leave their comfort zone. You must learn to trust the knowledge you have. For example, if economics is one of your strengths and you are consistently scoring high marks on sample questions, leave it. Trust yourself: if you know it now, you will know it on exam day — a quick review to maintain your knowledge is all that’s required. Focus your study efforts on a new topic — one that lies outside your comfort zone. Make sure you allocate sufficient time to complete your study segments. I suggest 45 minutes per segment. Try to complete one segment at a time. Then, check your comprehension by actively writing sample test questions. Writing as many sample exam questions as you can is a simple and effective study method that is often overlooked by students. Many industry exams, including the CSC, CFP, level one CFA and LLQP are 100% multiple choice. This provides the examiners with the ability to test not only simple recall of facts, but also analysis and application of the course concepts. Simply reading and repeating the material is not enough; you must be able to apply your understanding to concepts on the exam. Knowledge: The basic memorization of facts, formulas and figures. Comprehension/application: The application of a formula given a set of prevailing circumstances. Analysis/synthesis: The drawing of conclusions from the application of the information (for example, is a security overvalued or undervalued?). Evaluation: The candidate must voice his or her own opinion and recommend a course of action (such as, sell the security because it is overvalued). By actively practicing sample questions, you will begin to see how the concepts will be tested. You can equip yourself with the ability to make the link between reading the learning objectives and putting what you’ve learned to the test. Be sure to check back to Advisor.ca in the coming months for more insider tips and tools from Brian Gordon on getting the most out of your studies. Advance your career with the CFA Charter.